With over 100,000 artisan woven canvases, Yes!poho is ambitious to stitch the digital gap of India's handloom industry. If you get on a motorcycle and ride across India, you’ll find that every couple of hundred kilome-tres, everything changes. The language we speak, the food we eat, the clothes we wear and even the fabric those clothes are made with. Over centuries, intricate methods of weaving through various processes, material and styles have been created across literally tens of thousands of towns in India. These fabrics aren’t just pieces of cloth, they are lifetimes of evolvement of a singular looming process handed down from father to son, mother to daughter - generations getting better every time. A few decades ago, people travelled across the country to get these special fabrics. Some of these silks were stored as treasure, and many of them truly were. The Indian handloom industry was one of the only unorganised artisan sectors in India that survived the Industrial Revolution. This was because there was a deep understanding of these fabrics within the culture of the country and thus their authenticity was always important. Things are changing today. Besides a few towns whose names have become a part of the very lan-guage of Indian clothing, most of these places and their fabrics are largely fading out of relevance. In the age of e-commerce and one-day deliveries, logistics and convenience have largely replaced the need for authenticity or even specificity. There are times when a designer creates something using a certain fabric that gets in vogue and these towns experience a seasonal influx of business. But for the most part, you have skilled arti-sans that hardly make one hundred thousand rupees a year, toiling for months to produce these high quality fabrics. Due to this, many are failing to hand down their craft to the next generation. And you can’t blame them for wanting a better life either. Through these challenges, this unorganised handloom market in India is still home to over 4 million weavers who collectively produce 95% of all the handwoven fabric in the world with a market worth over 100 billion USD. What we have here is an industry with demand which is unable to access the market to its full po-tential. Over the last few years, the Indian Ministry of Handlooms and Textiles has launched the “India Handloom Brand” to certify authentic Indian handloom products and earmarked over 10 billion dollars in investment to help the industry. But business has to be driven by business. The solution to difficulty of access can only be ease of access. An interesting solution comes from an Indian-born serial entrepreneur from New York who be-lieves that Indian artisans should have nothing less than a global stage. Raghuram Kuchibhatla founded yespoho.com in 2018 with the intention of getting Indian weavers and indigenous design-ers onto a single platform which creates a rich digital retail experience for anyone in the world fas-cinated by Indian sarees. 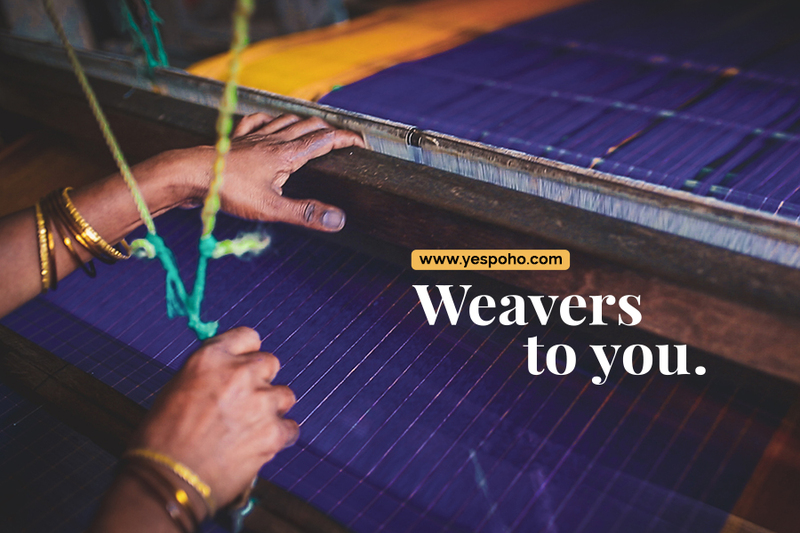 People at Yes!poho are approaching this by being directly involved with the weaving communities across India, having local partners in towns and villages as well as creating an online skill school for artisans and their next generation. They believe that by truly immersing themselves in the com-munity and working with each weaver one at a time, they believe they can drape the world 6 yards at a time, and drive a difference in the lives of these artisans and go beyond just creating com-merce. Currently Yes!poho hosts a vibrant fabric collection ranging from handmade Royal Kannchipuram Silk saree to beautiful linens , from all-time favourite Uppada to elegant Pochampalli, from Com-fort cottons to authentic Bannaras silk, all with a variety of prints. The Indian Handloom and Saree Industry isn’t just a market opportunity, it’s one of the richest ar-tistic traditions in history. This industry isn’t going anywhere anytime soon, but if we don’t take proper care of it or the artisans that create it, all we might be left with one day are power loom imi-tations of weaves that couldn’t find hands to be passed on to. But as long as the new age spirit of entrepreneurship keeps growing in India, we might still have hope.